The sum of these parts is depressingly nihilistic, although, or perhaps because, it is realized with such finesse. 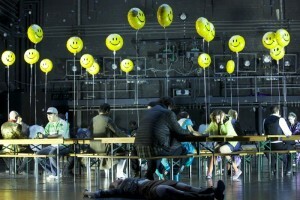 On Mathias Rümmler´s simple sets – a clutch of beer garden tables on a naked stage – Lehmeier´s lost souls idle away their time in mutual autistic apathy. Each chorus member is lovingly cast as an eccentric figure, and all the performances are impressively committed. Under Marc Niemann´s direction, the chorus sings well and the orchestra gives an impressive account of Gurlitt´s meticulously crafted score. In the title role, Filippo Bettoschi is the guy next door, your friend down the road, the everyman type of murderer, sonorous and expressive. Inga-Britt Andresson´s Marie is passionate and intense, the smaller roles are solidly cast and well-sung. In all, this is a thoughtful and scrupulous account of an intriguing work.